Beans… They’re Good for Your Heart – Live. Laugh. Love. Lake. Baked beans are such an old school dish but they’re perfect for feeding a crowd, especially at a summer cookout. I’ve played around with my tried and true baked bean recipe many times. I always start with canned beans, including a can or two of already-prepared baked beans, and doctor them up with various ingredients. I am not one to soak dried beans overnight, although I respect people who do because it seems like something serious cooks would adhere to. But really, who has the time? Anyway, I stumbled upon this recipe for Cowboy Baked Beans on Wicked Good Kitchen recently. It’s very similar to my recipe with one unusual addition: a dark beer reduction. I made a few tweaks and was very happy with the outcome. This is now my go-to baked bean recipe. Just look at those beautiful beans. Prepare the beer reduction: In a heavy saucepan over high heat, bring beer to a boil. Reduce heat to medium-high and continue to simmer until reduced by half to ¾ cup, about 20 minutes. Set aside to cool. Arrange oven rack in lower third of oven and preheat oven to 350º F. Spray 2-quart (9×13-inch) baking dish with cooking spray. Prepare the bacon and vegetables: In a large frying pan over medium heat, cook the bacon until browned and just about crispy, about 5 minutes. Reserve rendered bacon fat in pan. Add onion and cook until tender, about 2 minutes. Stir in chopped red bell pepper and green onions; sauté until crisp-tender, about 1 minute. Remove from heat and set aside. Prepare the beans: Combine beans and chilies in large bowl or stock pot; season with salt and pepper. Scrape bacon and vegetable mixture into beans. Season with salt and pepper; stir well to incorporate. Using rubber spatula, scrape and pour into bowl or stock pot and stir into bean mixture. Prepare the bean sauce: Add all of the sauce ingredients to the bowl or stock pot with the bean mixture. Stir well to incorporate. Using rubber spatula, scrap and pour mixture, evenly dividing, into baking dish. Bake in preheated oven until sauce has thickened, is bubbling and cooked through, about 90 minutes. Top with the precooked bacon slices and sprinkle with brown sugar (if using) after 30 minutes of baking. Remove from oven and transfer to cooling rack to rest before serving, about 5 minutes. 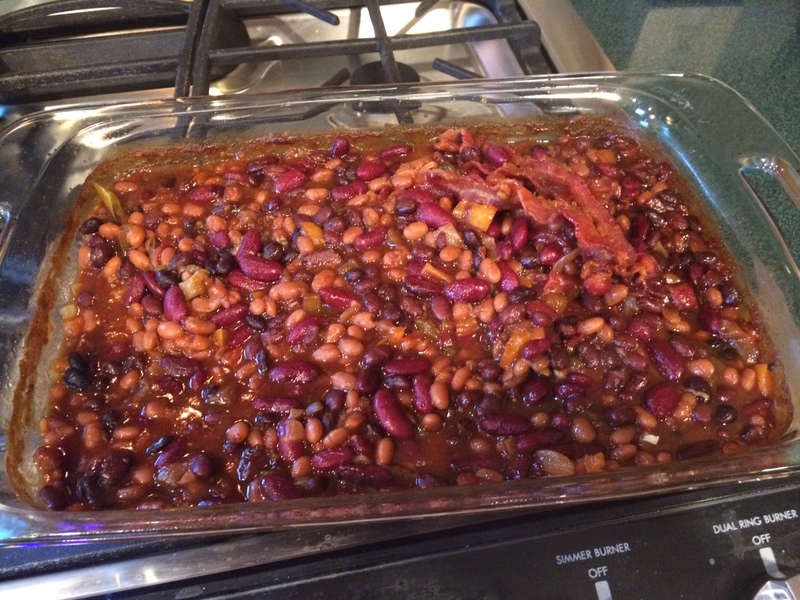 This entry was posted in Recipes and tagged Baked beans, cowboy baked beans, lake house, Spring Lake. Bookmark the permalink.